Manuals / Up-Grade / Info. and we will Drop Ship if available from manufacture..
Our all new Body Klip Retainers are going to save you an enormous amount of time and frustration. 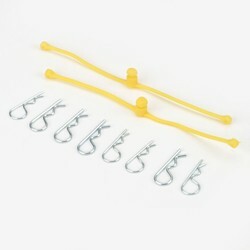 Simple installation by making a small hole in the body, insert the retainer, and attach to your clips. Available in 8 cool colors and also includes a set of small clips and a set of large Body Klips. 909598 Aluminium adjustment tool for use with the Centax II.